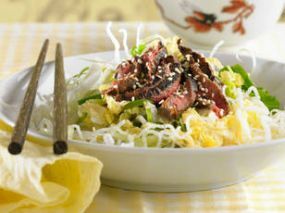 Beef Salad is a Cambodian Food Recipe for strips of grilled beef and cabbage salad. Gently mix all the ingredients together, adding the beef last. Serve on a plate decorated with lettuce leaves. Garnish with peanuts and chillies. I really love your Cambodian recipes. It is so easy to make! I have been looking for easy Cambodian food to make for a long time, but I could not find the right one. Then I came across your website and I really love how each one of the pictures look. Thanks again for posting all of your recipes. I am glad that you like our recipes Jan! Let us know if you tried some at home.